Although they can look very much alike and can fool both consumers and dealers, synthetic diamonds and natural loose diamonds undergo very different processes. Synthetic diamonds are created in laboratories through chemical means. On the other hand, natural diamonds are created through geological processes. However, this does not mean that synthetic diamonds are imitation or fake stones. In fact, they still contain some diamond material, though they are created by man, not nature. 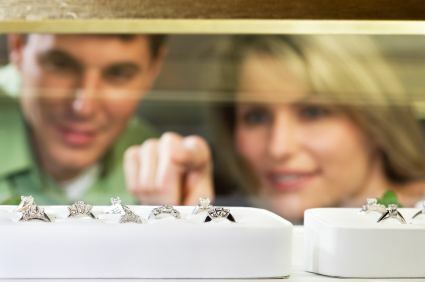 In this regard, the US Federal Trade Commission has suggested that terms such as “laboratory-created” or “laboratory-grown” be used for synthetic diamonds so as not to confuse consumers who want natural diamonds and cannot tell them apart from the synthetic ones. To be able to distinguish a synthetic diamond from a natural one, you can use several methods. One is to see if it is “too perfect to be real”. As with most things in life, if it’s too good to be true, it must not be natural. Geological processes are expected to involve certain flaws in the creation of a natural diamond. Imperfections or inclusions actually define a diamond, so it seems like a great way to tell which is which. However, this method can be hit-and miss, as those who manufacture synthetic diamonds can still integrate “imperfections” on their lab-created stones to pass them off as real diamonds. The Diamond Fog Test: This is easy enough to do provided you already have a real diamond with you. Place the stone in front of your mouth and fog it like you would do with a mirror. If the diamond stays fogged for more than a couple of seconds, then there is a possibility that it is a fake. Real diamonds disperse heat instantaneously. If you have a real diamond in hand, you can fog both and compare the time it takes for the fog to clear up. Check the Reflections: If you notice reflection in rainbow colors, then you’re probably dealing with a fake or just a low-quality diamond. Reflections from real diamonds usually manifest in different shades of gray. X-Ray Test: Have the diamond X-rayed if it’s possible. Natural diamonds will not show up on an x-ray, but synthetic ones will. Diamond Weight: Synthetic diamonds are almost always heavier than natural diamonds (as long as the dimensions are the same or very similar). Diamonds are one of the least dense gems found in the world and will always weigh less than any other gemstone or synthetic diamond. Make Sure you Buy a Certified Diamond: When you buy a loose diamond that is certified the certificate will state if the diamond is natural or not. Any type of enhancement or treatment has to be clearly stated on the accompanying diamond certificate.